The effort by the General Assembly’s Republican leaders to have the United States Supreme Court block the Pennsylvania Supreme Court’s decision to create new, fair congressional districts in our state is based on both a hypocritical attempt to undermine the rights of states and a flawed understanding of the subtle, yet fundamental, ideas of our constitutional system. The vehemence with which they are pursuing their case makes one wonder whether those ideas can survive in a day and age when so many politicians, especially on the Right, appear to have neither the intellect to understand principles that are the least bit complicated nor the integrity to follow them when they cut against the results they seek. The Pennsylvania Supreme Court invalidated the 2011 Congressional redistricting plan on the basis of the Pennsylvania Constitution not the United States Constitution. That is why the PA Supreme Court could act in advance of the US Supreme Court’s consideration of the redistricting cases before it. It is long established practice, based on the fundamental fact that the states have independent authority under our federal system of government, that the highest court in each state is the final arbiter of what the Constitution of that state says. Those decisions cannot be appealed to the United States Supreme Court unless there is some question about whether they violate the US Constitution. The Republicans argue that there is such a question in this case because the first half of the Elections Clause of the Constitution, holds that “The Times, Places and Manner of holding Elections for Senators and Representatives, shall be prescribed in each State by the Legislature thereof.” They hold that this clause clearly says that the legislature of our state, the General Assembly, which they lead, should draw Congressional district lines rather than the Supreme Court of Pennsylvania. The easiest way to understand the mistake the Republicans make in how they read the word “legislature” is to recall that the form of government that the United States and Pennsylvania have both adopted is based on two distinct, if partly competing, principles. The first is the separation of powers which holds that each of the powers of government — the executive, legislative, and judicial — should be mainly exercised by one governmental institution or, as we’ve come to call it, one branch of government. The executive power is mainly held by the president and governor, the legislative power by Congress and the General Assembly, and the judicial power by the federal and state courts. But the powers of government are not completely separated in the structure created by the constitutions of the United States and Pennsylvania because they also institute a second, partly competing, idea — the checks and balances. The central premise of the checks and balances is to give each branch of government some share in the governmental power held by the other two branches. Thus the president’s right to veto laws passed by Congress gives him a share in the legislative power while his right to appoint judges givens him a share in the judicial power. The Supreme Court’s right to declare laws gives it a share in the legislative power while its right to declare presidential and administrative acts in violation of law or the Constitution gives it a share in the executive power. And Congress’s right to create and fund executive departments and courts, and to impeach the president and his subordinates and judges, gives it a share in the executive and judicial powers. The checks and balances compromise the separation of power but were put in place by the framers of the Constitution for two reasons. The first is to give each branch of government some means to protect its primary power from encroachment by the other two branches. The second is to create a government that divides power among different and competing officials in order to encourage governing through slow and careful deliberation and to prevent tyrannical action on the part of any branch of government. If one understands this basic constitutional design of American governments, then here is the critical question in understanding the Elections Clause: By giving the “Legislature” the power to set the “time, place, and manner” of holding elections to the House of Representatives did the framers mean to empower all of those who hold the legislative power in the states to draw the lines? Or did they mean to give that authority only to the one branch of government in the states that primarily holds the legislative power? 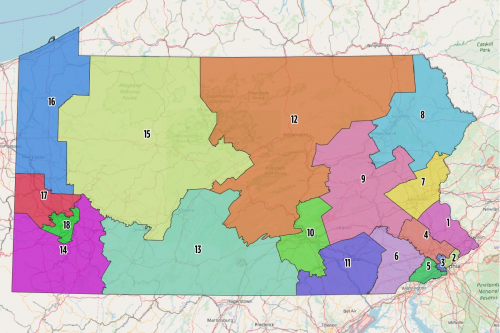 If the framers meant the latter, then the Republican complaint against the Pennsylvania Supreme Court might carry some weight since the PA Supreme Court has recently taken it upon itself to draw new Congressional district lines. But our history and prior US Supreme Court decisions make it clear that we should read “Legislature” in the Elections Clause as the legislative process that is created by the constitution of each state. And it is absolutely clear that the Pennsylvania Constitution gives the PA Supreme Court authority to draw Congressional district lines in certain limited circumstances. If we read “Legislature” in the Elections Clause as referring to the branch of government that holds (most of) the legislative power, then why should the governor of any state, including our own, have the right to veto a plan for creating congressional districts approved by our legislative body, the General Assembly? Some states do explicitly give the legislative branch of government sole authority to draw district lines by allowing them to do so through a joint resolution rather than through legislation. But in Pennsylvania and most other states, congressional district lines are drawn through legislation that may be vetoed by the governor. Whether this violated the Elections Clause was raised before the US Supreme Court in Smiley v. Holm in 1932 when the legislative body in Minnesota sought to have the US Supreme Court rule that the governor of Minnesota had no right to veto its redistricting plan. The US Supreme Court held that since a redistricting plan in Minnesota was a legislative act and that under the constitution of Minnesota, the governor of the state had a right to take part in the legislative process. The US Supreme Court adopted a similar line of thought in Davis v. Hildebrandt in 1916. Ohio had adopted a constitution that gave the citizens of the state the right to reject any law passed by its legislative body. A redistricting plan approved by the legislature was rejected in a referendum. The US Supreme Court held that this did not violate the Elections Clause because the Ohio Constitution gave some of the legislative power of Ohio to the people acting through a referendum. And finally, in 2015, in Arizona State Legislature v. Arizona Independent Redistricting Commission, the United States Supreme Court ruled that a popular referendum that created an independent redistricting commission to draw congressional lines did not violate the Elections Clause even though the commission entirely bypassed the state’s legislative body to do so. The Court ruled that under the Arizona Constitution the people had a right to enact legislation through the referendum process and that this legislative act met the requirements of the Election Clause. Under the Constitution of Pennsylvania, our Supreme Court has a right to invalidate acts of the General Assembly that violate the Constitution. And since 1790 the Constitution has guaranteed that “elections shall be free and just.” This provision, not found in the United States Constitution, is one of a number of Pennsylvania’s specific grounds under which the Pennsylvania Supreme Court found that the 2011 redistricting plan violated the Pennsylvania Constitution. Whether one agrees with that decision or not, it is absolutely clear that the PA Supreme Court has the right to make it. A judicial decision to declare legislation unconstitutional generally leaves it to the primary legislative body to draw new legislation that meets the requirements of the Constitution. But there are times when the Courts may legitimately step in and act on its own accord. The Supreme Court gave the General Assembly and governor enough time to enact new redistricting. Modern computer technology enables anyone to draft a number of such plans in hours and a General Assembly in which leadership usually can carry their members with them could have enacted such a plan in a few days. But not only did the General Assembly not enact a new redistricting plan, it did not even try to do so. Given the necessity of having a plan in place in time for the 2018 primary election, the Court also had the right to put its own plan into place. Indeed, this is not the first time the PA Supreme Court had to take on this responsibility because of the General Assembly’s failure to act. In 1992, after the General Assembly had failed to pass a Congressional redistricting plan, the Supreme Court of Pennsylvania appointed Judge Craig of the Commonwealth Court to draw up a redistricting plan, which it approved after a number of court challenges. The Republicans are not happy with the redistricting plan approved by the Court because they think it has a Democratic tilt. It appears, however, that in a normal election, Democrats are likely to win 6-8 Congressional seats while Republicans win 8-10 with 2 to 4 of them being closely competitive, even though the overall state vote for Congress is usually about 50-50. This slight Republican tilt is the result of the tendency of Democrats to cluster together, and the Constitutional requirement that any redistricting plan create districts that are compact and contiguous and that do not split county and municipal lines more than necessary to create districts with nearly equal population. But while it has a slight Republican tilt, this plan is far from the 2011 districts, which was a massive and egregious act of partisan gerrymandering that created 13 Republican districts and only 5 Democratic ones. It is no doubt possible that another plan that also met the Constitutional requirements could have been created that tilted a little further to the Democrats or to the Republicans. Indeed, given their complaints about the plan put in place by the Pennsylvania Supreme Court, one wonders why they did not act quickly to pass a plan a bit more favorable to them. Indeed, the plan Governor Wolf put forward is slightly more favorable to Republicans than the Supreme Court plan and had the Republican leadership embraced it and asked for more time to pass it, it is hard to believe the Supreme Court would have not granted them that extra time. But Republicans were more determined to object to the entirely appropriate intervention of the Court than they were willing to play by fair rules. Either they believed their own mistaken criticism of the Supreme Court’s action or they were determined to create the appearance of a constitutional crisis by calling the Court into disrepute. This is not the place to speculate about why Speaker Turzai and Senate President Scarnati chose the path they did. But it is based on a tendentious and faulty analysis of the place of the Pennsylvania Supreme Court in the constitutional system of Pennsylvania. And, for Republicans who generally support states’ rights, to call on the US Supreme Court to overturn that decision is not only based on profoundly wrong analysis but is deeply hypocritical.